The internet was on fire last weekend when Jaden Smith confessed his love for Tyler, the Creator when he took the stage at Camp Flog Gnaw Carnival, but now, fans are confused not knowing if Jaden was just kidding around. The 20-year-old rapper, Jaden Smith, took the stage at Camp Flog Gnaw Carnival and professed his love to the carnival’s famous founder, Tyler, the Creator. “I just want to say Tyler, the Creator is the best friend in the world and I love him so f***ing much,” Smith screamed into the microphone. The camera then moved to the 27-year-old fellow rapper, Tyler, who wagged his finger in the air as if to say no and shook his head before laughing. Jaden later went on to Twitter and confirmed the news but a few days later deleted the tweet. The fans are still waiting with bated breath but some believe they are just joking around and promoting their upcoming music collaboration. Others say that Jaden deleted the tweet since he moves too fast for Tyler and needs to slow down. Both rappers have always been notoriously ambiguous about their sexualities so we can’t be sure. Jaden seems to be doubling down on his claim that he’s in a relationship with Tyler, the Creator. “I recently said that Tyler, the Creator is my boyfriend and that’s true, so, just so you know,” Smith reaffirmed during Friday’s episode of his Apple Music Beats 1 Radio Show, MSFTS Frequency. Tyler, the Creator has recently discussed his sexuality in what appeared to be a breakthrough moment on his last album Flower Boy, and has since been more open about his refusal to accept labels. Smith, who recently released a new collaboration with Harry Hudson titled “Just Slide”, has also been relatively open in discussions of sexuality and is known for his androgynous fashion style. Smith is open about his gender fluidity and has previously dated Sarah Snyder and Odessa Adlon. 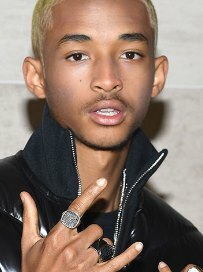 Tyler, for his part, revealed recently that he dates men so we think his long-term friend Jaden was just messing with him. Nevertheless, we support them both in their music and love lives. In a recent interview Will Smith commented Jaden’s confidence saying he is the most certain, confident and comfortable person he has ever met in his life and that he really doesn’t care about labels and what people are talking about him. He is just living his life, becoming what he wants to be and we sure need more fathers like Will Smith. He did a great job raising him.